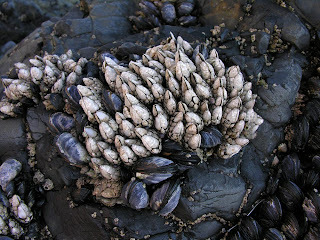 Animal Wildlife | Barnacle | The barnacle is a hardy animal that is found in or very closely to sea water. Although it is frequently confused for a mollusc because of its hard outer shell, it is actually a crustacean, closely related to crabs and lobsters. Barnacles are most often seen as roughly circular sessile invertebrates (which means that they cannot move on their own), and are permanently attached to the substrate they live on. In their juvenile form they are free-floating, but eventually they attach themselves to any nearby rock, shell, or other object and stay there for the rest of their lives. Their shells are composed of calcite. Barnacles are often seen on crabs, whales, boats, rocks and on the shells of sea turtles. Although some species of barnacle are parasitic, most barnacle species are harmless, because they are filter feeders and do not interfere with an animal's normal diet and do not harm that animal that they live on in any way. 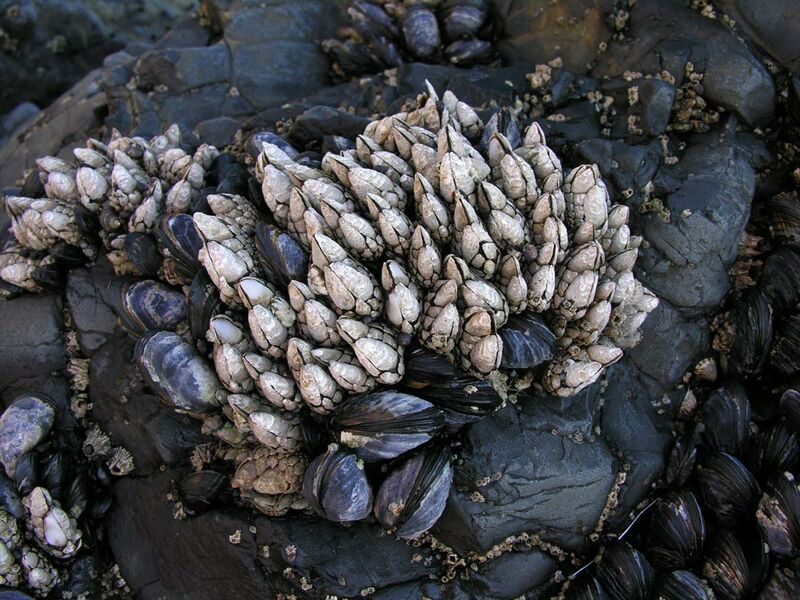 Many species of barnacle are so harmless that in fact, an animal that is covered in them, may not even notice! There are more than 1,000 known species of barnacle that inhabit shallow and tidal waters around the world. Although many species of barnacle are very small, some can grow to as large as 7cm and even bigger barnacles can often be seen. 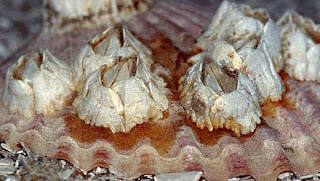 Barnacles typically live for between 5 and 10 years, but some of the larger species are known to be much older. Barnacles attach themselves to animals when they are very young and in the larvae stage of their lives. Once the baby barnacle has effectively glued itself to something hard, a thin layer of flesh wraps around the barnacle and an outer shell is produced. Once the barnacle has an outer shell, it is protected from the elements and all kinds of predators. As soon as the baby barnacle has fixed itself onto something, it is generally there for the rest of it's life. Barnacles are filter feeders (also known as suspension feeders) that feed on food particles that they strain out of the water. 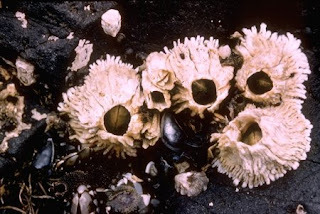 The shell of the barnacle is made up of a number of plates (usually 6), with feathery leg-like appendages that draw water into their shell so that they can feed. Barnacles have numerous predators, particularly when they are babies and floating around in the water looking for something to attach themselves to. As the barnacle larvae are so tiny, they float around with the plankton in the water. Once the barnacle is older and has it's tough outer shell, few predators can actually eat it. Humans are known to eat goose barnacles (the only edible species of barnacle) in parts of Europe like Spain and Portugal. Most species of barnacles are hermaphroditic which means that they have both male and female reproductive organs. 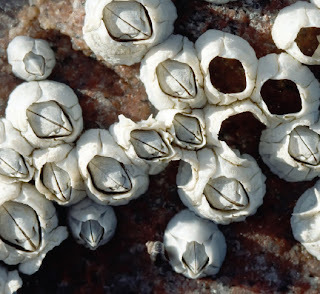 Although it is possible for barnacles to self-fertilise their eggs, it seems to be very rare so the eggs produced by one barnacle are usually fertilised by another barnacle. It takes more than 6 months for the barnacle larvae to start developing into the hardier adult barnacles. Barnacles are thought to be one of the oldest surviving creatures on the planet as they are believed to date back millions of years. Although there will have been some adaptations, the barnacle is thought to have changed very little over that time. Despite the rising levels of pollution and changes in the water, barnacles are thought to be one of the few animals that are not greatly affected. The barnacle slides two of it's six plates across to let water in when it is feeding and then closes them again which prevents the barnacle from being too exposed to dirty water.